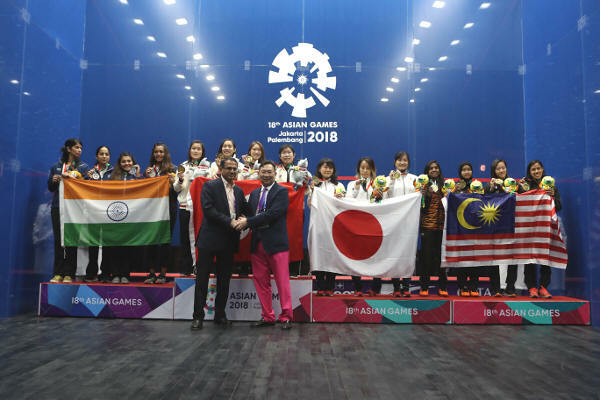 After Hong Kong China despatched India 2/0 to clinch the women's Asian Games Team Championship Squash title for the first time, Malaysia denied the highest-ranked team in the event a historic double by coming from behind to beat the favourites 2/1 in a dramatic men's final at the Gelora Bung Karno Sports Complex in Jakarta, Indonesia. The women's final was a repeat of a qualifying tie 48 hours earlier in which Hong Kong, the second seeds, overcame third seeds India 2/1 to claim pole position in Pool B. But India earned the re-match in the final after creating the event's biggest upset by ousting defending champions Malaysia, the team led by the newly-crowned 'Greatest Player of All-Time' Nicol David who were seeded to take gold for the third successive time. 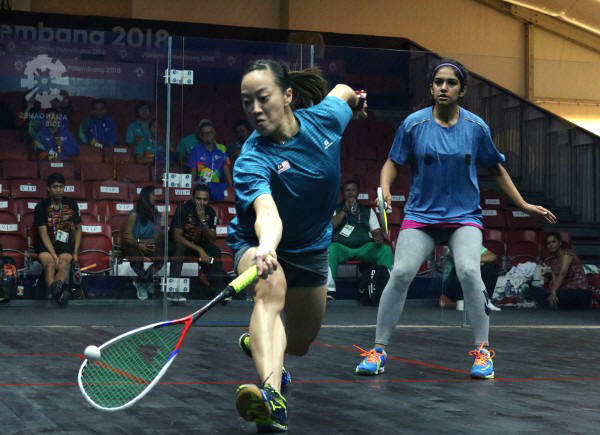 The third seeds were unable to reverse the outcome, however, as third string Sunayna Kuruvilla went down in four games to Ho Tze-Lok - before talented left-hander Annie Au clinched gold for Hong Kong after beating Indian top string Joshna Chinappa (both pictured above) 11-3, 11-9, 11-5 in 28 minutes. 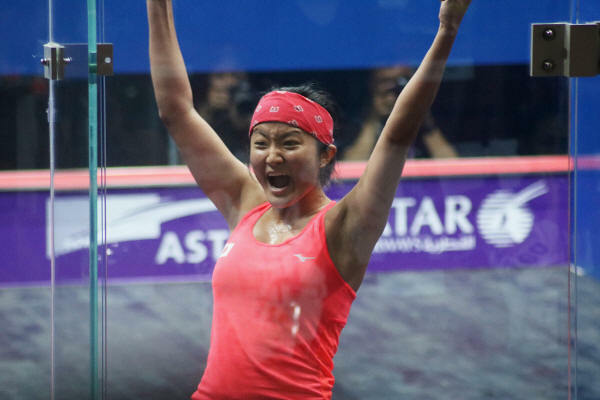 "I think they played very well especially under pressure," HK team manager Rebecca Chiu told www.squashmad.com . "I'm very happy for them and they certainly deserved this success," added the 2002 Asian Games individual gold medallist. Picture above shows the women's presentation group. Hong Kong and Malaysia both reached the Jakarta men's final unbeaten - and both were looking for first-time title success. And the elusive double looked on the cards when, in the opening clash between the teams' third strings, Yip Tsz Fung put Hong Kong ahead with a four-game win over Malaysian Ivan Yuen - after surviving a marathon 20-18 second game. With the crowd on the edge of their seats, Malaysia drew level when team number one Nafiizwan Adnan (seen above celebrating his breakthrough win) defeated higher-ranked Max Lee 11-9, 11-7, 11-7. Having not played in the earlier individual event, Malaysia's second string Eain Yow Ng - at 20, the youngest player in the squad - had no Games history against his Hong Kong opponent Leo Au, the 2018 men's individual gold medallist. 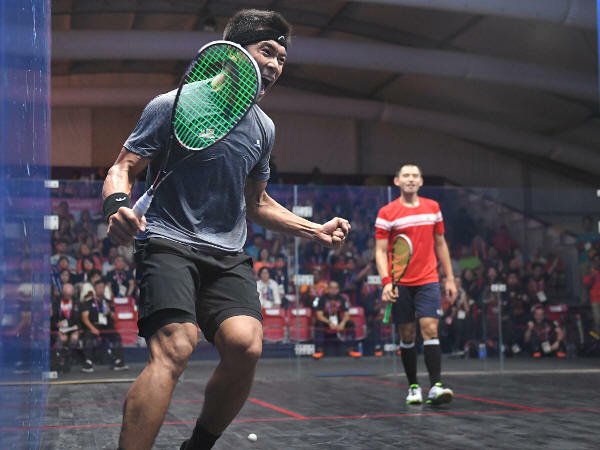 But in the biggest match of his career so far, the young Malaysian truly came of age when he trounced Au in straight games, 11-7, 11-7, 11-4 in 36 minutes to bring the gold medal to Malaysia. "As a team we bonded well," said the jubilant Ng (pictured above with his team-mates in the men's presentation group) after his seventh straight win in the championship. "We came into the tournament knowing that we can win and we certainly did it. "I always believed that Nafiizwan will deliver a point for us and I was really just focused on my own game. But I also did my homework well. I did a lot of video analysis and the fact that I didn't play in the individual but managed to beat the individual champion, certainly worked out well in the end." Malaysian captain Adnan was also in jubilant spirits (as seen above) at finally clinching a Games team gold in his third appearance in the event. "I did not want to bow out of my third Asiad without a fight. I was on the losing team twice already so I really gave it everything I had. Of course there was pressure when Ivan lost. But pressure is like a dessert and I love dessert." 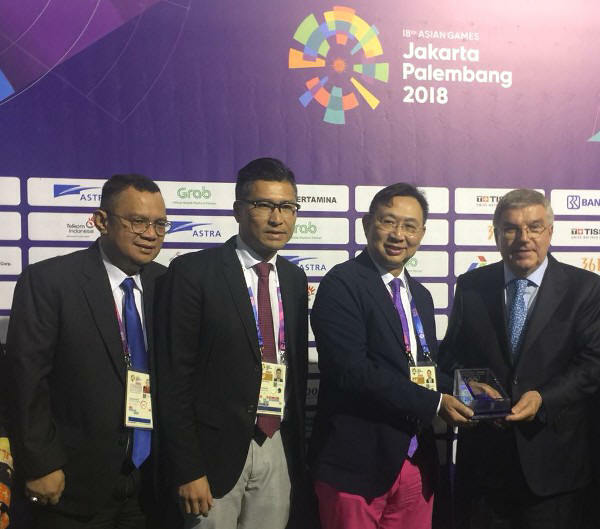 IOC President Thomas Bach was guest of honour on Squash team finals day at the Gelora Bung Karno Sports Complex. Picture below shows Bach, far right, receiving a presentation from Asian Squash Federation President David Mui. After previously only having contested the women's final (in 2010), Hong Kong China will compete in both Asian Games Team Championships Squash finals for the first time tomorrow (Saturday) following 2/0 victories in both semi-finals at the Gelora Bung Karno Sports Complex in Jakarta, Indonesia. 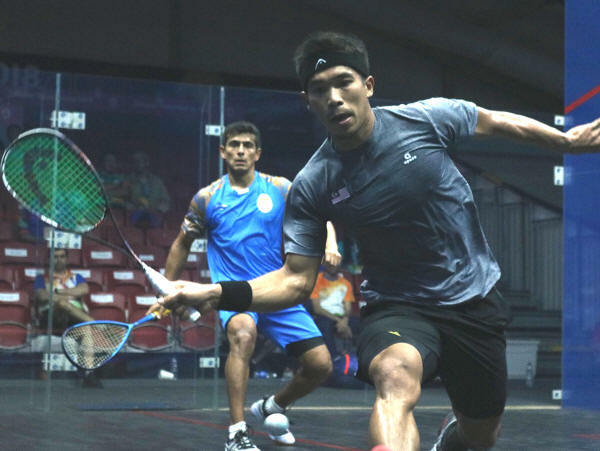 In the men's semis, the favourites despatched second seeds India - top string Max Lee seeing off Indian number one Saurav Ghosal (pictured above, right, with Lee), the highest-ranked player in the tournament, 11-7, 11-9, 13-11 before the recently crowned Asian Games individual gold medallist Leo Au battled for four games to overcome Indian Harinder Pal Sandhu 11-9, 9-11, 11-9, 11-3. "Max and myself played a tough individual final," Au later confided to www.squashmad.com . "We're glad we managed to have been able to take turns to rest the last two days, which helped us recover. Hopefully, we'll both be at our best again tomorrow and go for another gold." 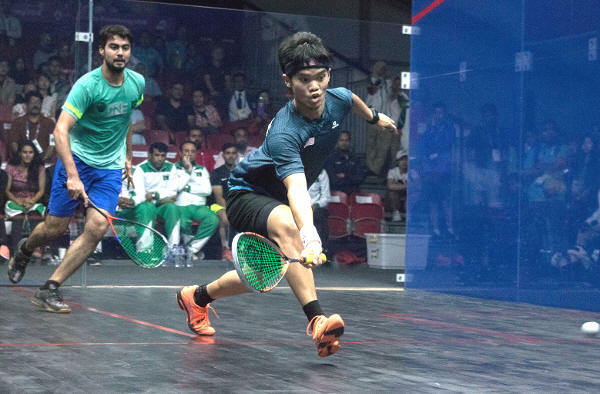 Hong Kong's opponents will be Malaysia, the No.3 seeds who reached the final for the third time in a row by beating fourth seeds Pakistan 2/0 - team number one Nafiizwan Adnan claiming his first win in the tournament with an 11-8, 11-6, 11-6 victory over Pakistani Tayyab Aslam before Eain Yow Ng sealed the place in the final after overcoming Israr Ahmed 7-11, 11-8, 16-14, 11-6. Ng (pictured above, foreground,in semis action) said later: "Really happy to have won that and close the tie out. He had nothing to lose and was firing everything in, but I just stuck to my game and made it tough for him. It was a tough one but really happy to get Malaysia through." The day's biggest shock took place in the first women's semi-final when third seeds India beat favourites and defending champions Malaysia 2/0 - thereby ending the legendary Nicol David-led team's eight-year reign as Asian Games champions. Indeed David, who came into the team event as women's individual gold medallist for a record fifth time, suffered her first defeat in Jakarta at the hands of Indian number one Joshna Chinappa. It was only in April that Chinappa (pictured above, foreground, with Nicol) was able to end a 14-match losing streak to the Malaysian superstar stretching back to the Asian Championships in 2002. Clearly invigorated by this breakthrough win, Chinappa further reduced the head-to-head deficit, stemming a courageous comeback by David to beat the former world number one 12-10, 11-9, 6-11, 10-12, 11-9 in 66 minutes. 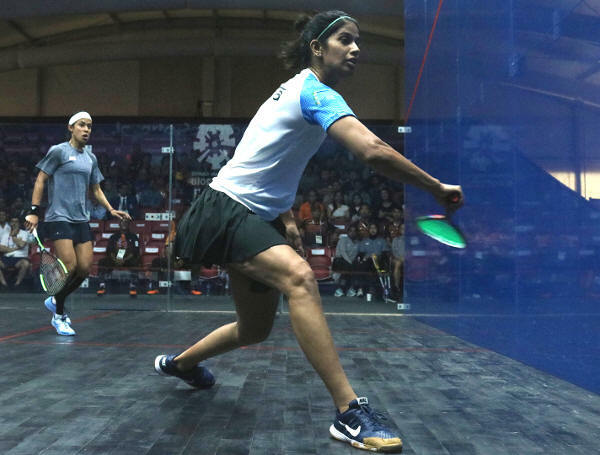 Team-mate Dipika Pallikal Karthik took full advantage of this unexpected lead, going on to beat Malaysian second string Low Wee Wern 11-2, 11-9, 11-7 to secure the unexpected place in the final. The ever-magnanimous David, who will now add a bronze medal to her collection of seven Asian Games gold medals, said later: "The Indian team, they played very well today. We just lost to a stronger team today. We have a good team and it's just unfortunate that they were better today. "Winning a medal here is still something to be proud of. We came and we fought hard. I don't think any of us would go into the court not giving our best and that's the main thing." India now have to face Hong Kong in their second tie against the second seeds in 48 hours. Led by world No.11 Annie Au, Hong Kong denied Japan a place in the final by beating the fourth seeds 2/0. Japan were celebrating their first time in the medals and losing second string Misaki Kobayashi, the team's captain, said later: "This is my third Asian Games and it means a lot to me to go home with a bronze medal as this is one of my last tournaments as a full time professional player. "Four years ago we lost out a semi-final place to Korea very closely, so we've waited for this moment for a long time. Realistically there's still a gap between us and the rest of the top three countries. So I think we've done our best for now." 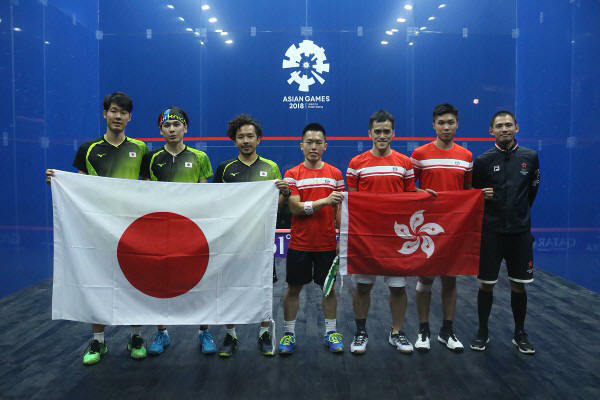 Today's final Squash qualifying action in the Asian Games Team Championships in Indonesia saw the women's team of Japan and the Pakistan men's team complete the semi-finals line-up at the Gelora Bung Karno Sports Complex in Jakarta. Fourth seeds Japan faced rivals Republic of Korea to decide the second position in the women's Pool A - and a place in the last four knockout stage. Honours were shared after the first two matches - Misaki Kobayashi winning for Japan before Ji-Hyun Lee levelled the tie for Korea. Teenager Satomi Watanabe (pictured above) clinched victory for the fourth seeds after defeating the Korean number one Yura Choi 11-7, 11-8, 12-10 - an emotional victory which put Japan into the semi-finals, with the certainty of a medal, for the first time. 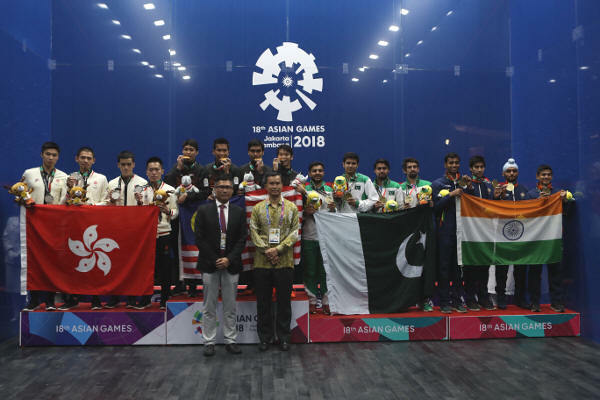 It was in Pool A of the men's event that fourth seeds Pakistan battled with Republic of Korea for the final place in the other semi-final line-up. The 2010 gold medallists achieved their goal in style - Asim Khan, Tayyab Aslam and Israr Ahmed all beating their Korean opposition to secure second place in the pool. 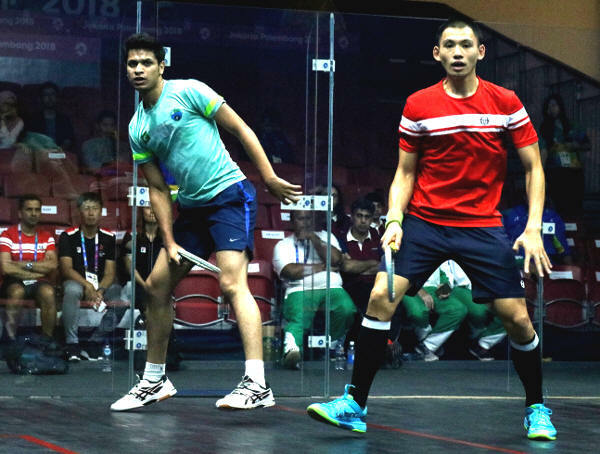 The key clash in Pool B saw No.2 seeds India and third seeds Malaysia - both of whom were already certain of semi-final berths - go head-to-head for top position in the pool. 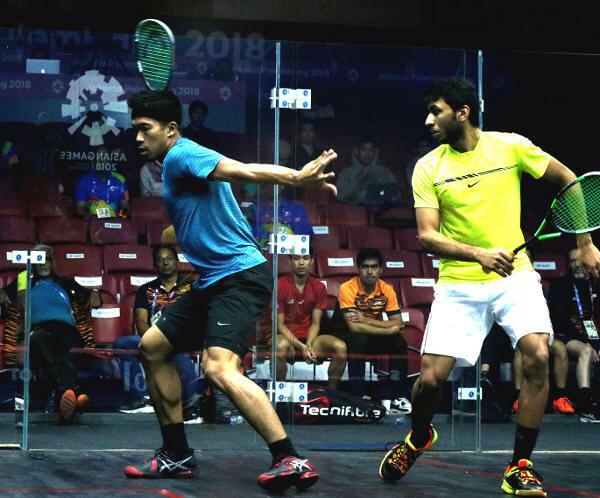 Underdogs Malaysia clinched victory after wins by Eain Yow Ng and Ivan Yuen, second and third strings, respectively - but Indian number one Saurav Ghosal restored pride in the team by winning the third match, defeating Nafiizwan Adnan (pictured below, right, with Ghosal) 11-5, 9-11, 11-8, 12-14, 11-7 in 58 minutes. Meanwhile Indonesia's women's team showed their promise by recording their third shock win in Pool B. Seeded 10, the hosts beat Thailand 3/0 to record a hugely-impressive third-place finish in the Pool in their maiden appearance in the event. 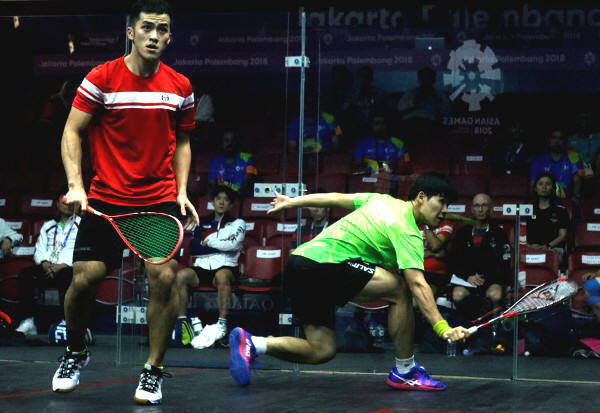 With a fourth day of qualification action still to go, Hong Kong China, India and Malaysia are already guaranteed medals in both the men's and women's Squash events in the Asian Games Team Championships at the Gelora Bung Karno Sports Complex in Jakarta, Indonesia. Defending champions and top seeds Malaysia can look forward to a rest day in Pool A of the Women's event after claiming maximum points following a 3/0 win over Japan, the fourth seeds. The men's team of Malaysia also did enough to secure a place in the semi-finals after beating sixth seeds Qatar in Pool B. But the third seeds dropped the first match after Nafiizwan Adnan went down in straight games to the Qatari number one Abdulla Al-Tamimi (pictured below, right, with Adnan) - the fourth highest-ranked player in the event who has yet to lose a match in the team event. It was sweet revenge for the 23-year-old from Doha who was denied a place in the individual event semis after losing to Adnan. 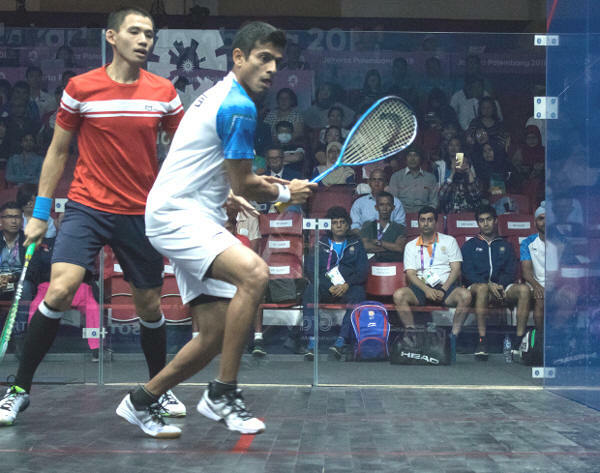 Rested after sustaining an injury in the individual event, world No.12 Saurav Ghosal made a welcome return for India and led the country's second-seeded men's team to a 3/0 win over Thailand - and a place in the semi-finals. Hong Kong, favourites to win the men's gold medal for the first time, beat key Pool A rivals Pakistan, the fourth seeds, 3/0 to ensure their place in the semis. Individual championship runner-up Max Lee beat Pakistani Asim Khan (pictured below, left, with Lee) in four games to put Hong Kong ahead before singles gold medallist Leo Au clinched the tie win for the top seeds. Meanwhile Pakistan join Japan and Republic of Korea as rivals for second place in the Pool. But, despite no chance of a semi-final berth, hosts Indonesia continued to create waves in the women's event. The 10th seeds, making their debut in the event, claimed their second upset after beating seventh seeds Iran 2/1. 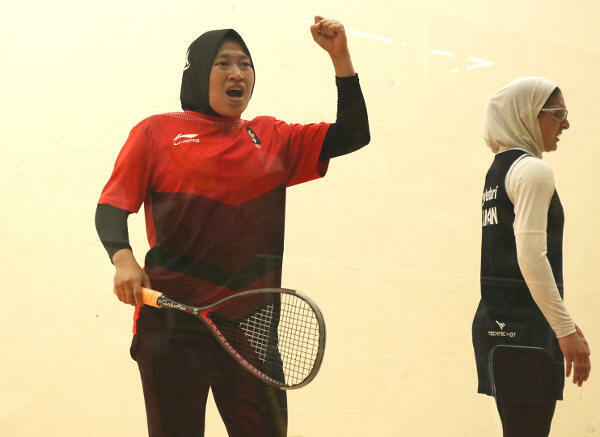 It was after team top string Catur Yuliana won the opening match that the home side's second string Yeni Siti Rohmah clinched victory (seen celebrating below) after recovering from 2/1 down to beat Iranian Fereshteh Eghtedari 11-7, 10-12, 7-11, 11-8, 11-8. Hosts Indonesia took centre stage on the second day of Squash action in the Asian Games Team Championships with an historic Pool upset over sixth seeds China in the Women's event at the Gelora Bung Karno Sports Complex in Jakarta. 10th seeds Indonesia, without any ranked players in their squad, were making their debut in the Games. After the home side's number one Catur Yuliana lost to China's Li Dongjin, her team-mates thrilled the partisan crowd by taking the next two matches to win Indonesia's first ever tie in the event - second string Yeni Siti Rohmah beating Gu Jinyue 11-8, 15-13, 11-7 before third string Irma Maryani despatched Chinese opponent Duan Siyu 11-5, 11-7, 12-10 to clinch victory. Hong Kong number one Annie Au, the left-hander making her third appearance in the team championships, was in action in both ties - first beating Iran's top player Ghazal Sharafpour 11-1, 11-2, 11-5, then taking out China No.1 Li Dongjin 11-2, 11-7, 12-10 (both pictured above). Hong Kong were also in action today in the men's event. Favourites to win the title for the first time, Hong Kong beat Republic of Korea 3/0 in Pool A - second string Yip Tsz Fung clinching victory by beating Seung-Taek Lee (pictured above, right, with Yip) 11-6, 11-2, 11-2 after top string Max Lee had put the top seeds ahead. In Pool B, second seeds India maintained their winning streak in the event - but were taken the full distance by Qatar, the sixth seeds. Underdogs Qatar went ahead when world No.28 Abdulla Al-Tamimi beat Harinder Pal Sandhu in straight games. 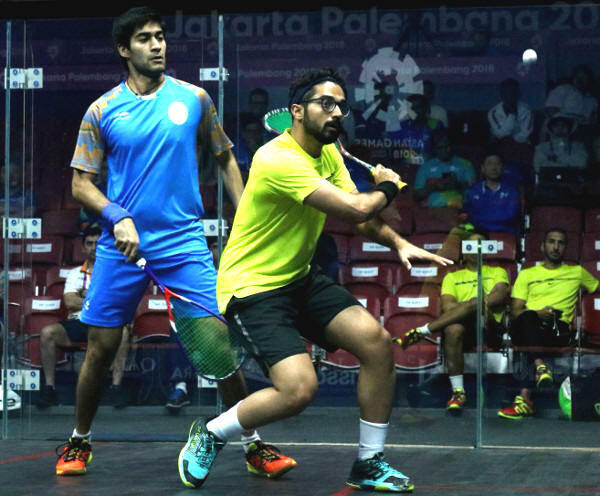 But team-mates Ramit Tandon and Mahesh Mangaonkar restored order for the defending champions - Tandon beating Syed Azlan Amjad (pictured below, right, with Tandon) 11-3, 11-5, 11-3 before Mangaonkar made sure of the 2/1 win by overcoming Qatari Abdulrahman Al-Malki 11-9, 11-6, 11-2. 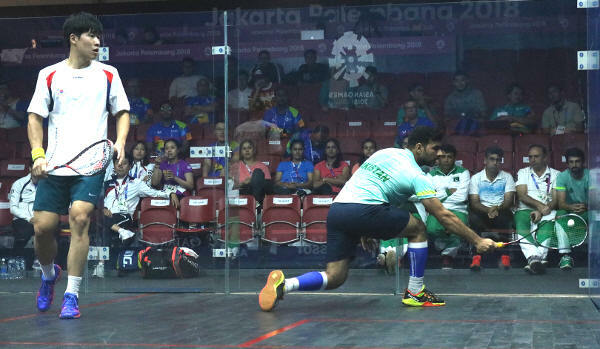 India and Malaysia, defending champions in the men's and women's events, respectively, both recorded two 3/0 wins in today's first qualifying rounds of the Squash Asian Games Team Championships at the Gelora Bung Karno Sports Complex in the Indonesia capital Jakarta. 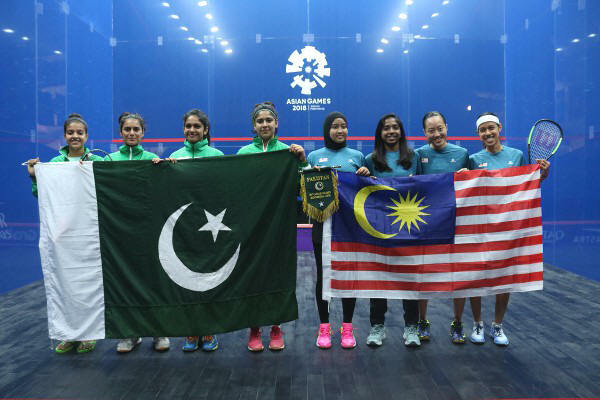 Fresh from a record fifth gold medal in the women's individual event, Nicol David led favourites Malaysia to decisive victories over Pakistan (both teams pictured above) and Philippines. 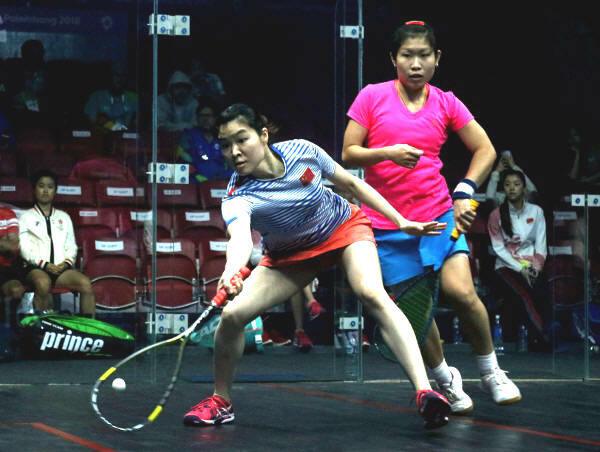 Both ties saw a successful return to international action after a four-year injury layoff by Low Wee Wern, the former world No.5 from Penang (pictured above in action with Pakistan's Faiza Zafar). 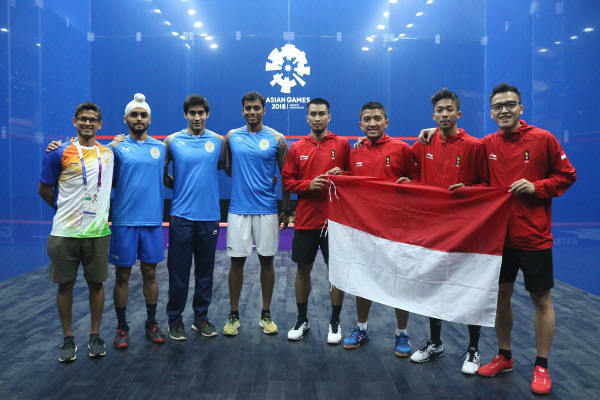 India, winners of the men's team gold medal for the first time in 2014, defeated hosts Indonesia (both teams pictured below) and Singapore - in both ties resting team number one Saurav Ghosal, a bronze medallist in the individual event. But India are the No.2 seeds - behind favourites Hong Kong China, led by the two men's individual finalists Leo Au and Max Lee. Both players were in team action today as the top seeds dismissed Philippines and Japan (the two teams seen below), both 3/0. Two further days of qualifying action will take place before the top two teams in both pools come together for the semi-final knockout stages.